Join the odds and the evens in their interstellar struggle to bring peace to the universe. Just as in the classic game of war, the highest card wins each hand. Matching cards means war! Play powerful space ship cards to alter the outcome of cosmic encounters. Collect all the cards to win and leave your opponent in outer space. To do so you must face paralyzing space germs, the hungry even and odd eaters, and the treacherous black hole! 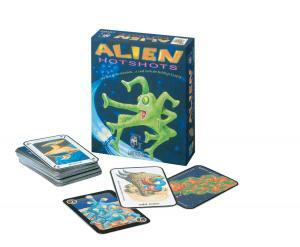 Alien Hotshots plays with the ideas of space travel. Is there life beyond Earth? What would it be like to fly near a black hole? The game play is a fun introduction to the ideas of odd and even, and the strategic importance of deterrence. We hope that kids will be inspired to visit their local library or planetarium to learn more about space.